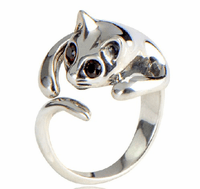 925 sterling silver finger ring - cat eyes 9 kinds of colour availble. This Thai Silver Ring is handmade in Thailand from 925 sterling silver. There are 9 colors of the cat eyes. Please choose the one you love.